With March in full swing, Hong Kong’s Art Month is really hitting its stride—and it’s not only galleries and fairs where you can get your art on in the upcoming weeks. As part of Landmark’s dynamic A Year of Play campaign, the luxury shopping mall is treating visitors to a beautifully immersive art exhibition, Nature in Motion, from now to April 14. An imaginative exploration of the interplay between nature, art and style, the exhibition features a pair of installations in Landmark—Meadow, which is a creation of acclaimed Dutch art collective Studio Drift, and The Shapes of Water, by iconic Italian fashion house Fendi. 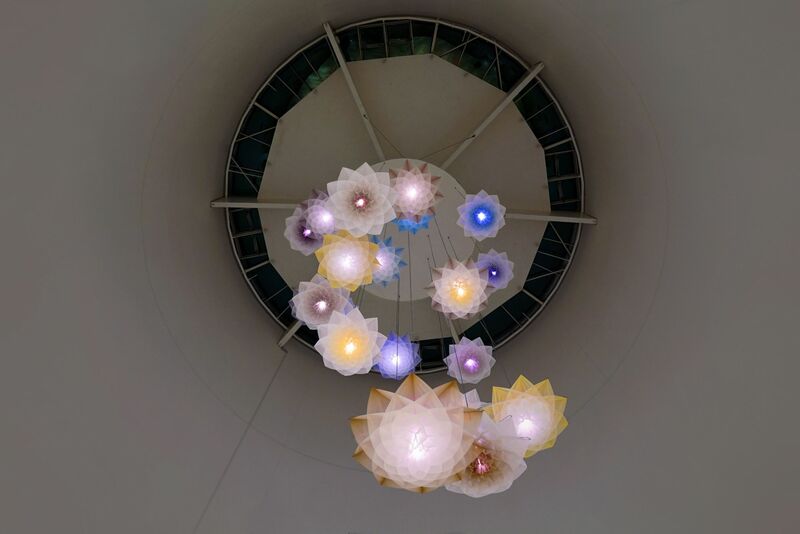 Suspended from Landmark Atrium’s ceiling, the breathtaking Meadow is a kinetic sculpture of 18 mechanical flowers that open and close in poetic movement—creating a perpetually shifting landscape of light and shade. The vision of Studio Drift’s founders Lonneke Gordijn and Ralph Nauta, Meadow represents growth and the changing of seasons, with its blossoming flowers designed to be viewed as a grand botanical creature dancing in harmony with the space around it. Through Meadow, Gordijn and Nauta hope that passers-by can experience their own moment in nature, and feel a greater connection to both the environment and each other. Meanwhile, Fendi’s The Shapes of Water features ten cast resin fountains crafted by Dutch designer Sabine Marcelis—with Landmark exclusively being the first destination in Asia to host the exhibition. Rome’s famous fountains have long been a key element at the heart of the historic fashion house and this installation, a homage to the delicate beauty of water, is a perfect encapsulation of Fendi’s creative, proudly Italian spirit. Featuring flowing water and an ombré of warm shades evocative of Roman sunsets, each of the exhibition’s fountains is inspired by the fashion house’s most iconic symbols, motifs and craftsmanship—including the inimitable FF logo created in 1965 by Karl Lagerfeld, their signature fur and leather patterns, the architecture of Palazzo della Civiltà Italiana (Fendi’s headquarters), and the brand’s beloved Peekaboo handbag. With their focus on ethereal materials and soft colour palettes, Meadow and The Shapes of Water complement each other seamlessly to create Landmark’s stunning Nature in Motion dual art exhibition. The spirit of Nature in Motion continues to Fendi’s boutique in Landmark, where unique versions of the Peekaboo handbag—world-exclusives designed by the brand’s creative director, Silvia Venturini Fendi—will only be available to purchase at Landmark during the exhibition period. Customers at Landmark will also receive bonus Bespoke Reward Points for shopping at Fendi or using Style Concierge on the Landmark Hong Kong app during this time.